I have really embraced my love of coconut oil. I use it for everything: cooking, baking, chapstick, etc. In the winter, it becomes a pretty solid mass since it’s not warm in my kitchen. When I want to dig out 1/2 cup for something, that can be a bit difficult. 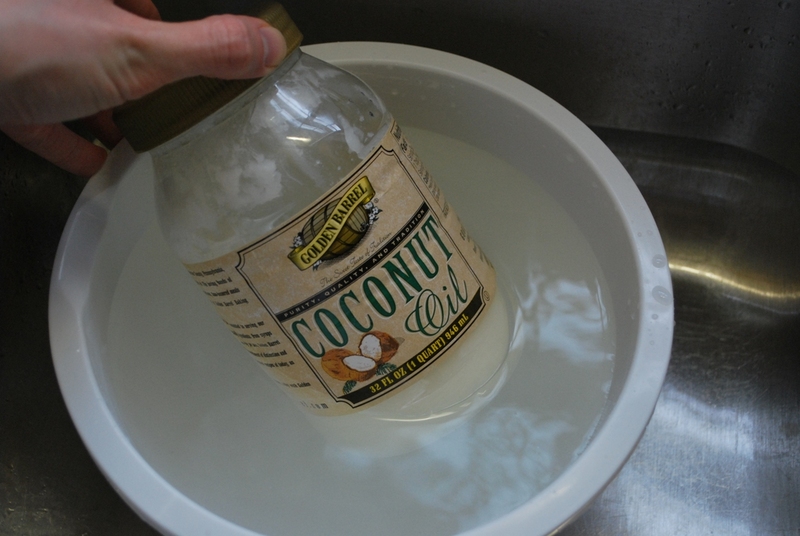 So, I run some warm water and put my container of coconut oil down into it. After several minutes, it’s warm enough to scoop and if my water is hot enough, it becomes warm enough to pour. You could also set your container on your stove if your oven is on – but I’ve found this can take a bit longer. I don’t just throw that water out when I’m done. I let it cool down and put it into my Berkey Water Filter. I use it one for one in anything that calls for oil – and sometimes even in things that call for melted butter. 🙂 You will LOVE IT! I use it also in place of solid butter. Just made pie crusts with coconut oil (then you do want the oil hard) and they were great (made pasties). I like using palm shortening for pie crusts. Yum! Coconut oil is one of those “miracle” oils that seems to have uses everywhere. I use it to make soap and my own cosmetics (body lotions etc) at home. Very handy.